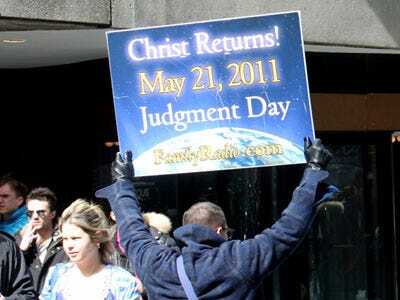 We picked up a pamphlet in Union Square to see why so many people are talking about the world ending on May 21, 2011. It turns out the theory comes down to two numerological proofs. The first proof is based on Genesis 7:4, when God said to Noah: "Seven days from now I will send rain on the earth for forty days and forty nights, and I will wipe from the face of the earth every living creature I have made." The second proof looks at the significance of the number of days between the Crucifixion and May 21, 2011. There are 722,500 days between these dates. 722,500 is a significant number because it is composed of the significant numbers 5x10x17x5x10x17. Five signifies redemption; ten signifies completion; and 17 signifies heaven. The numbers represent the day of redemption (5) and the Christian era (10) and the ascent to heaven (17) -- and these factors are doubled for added significance. We'll know for sure in 27 days.